Our Audi dealership near Tampa, FL offers a grand selection of new and used cars. It is the ideal location for anyone who lives in Clearwater to address all their Audi vehicle needs. In addition to offering new and used cars, Audi Clearwater takes great pride in their terrific financing options, Audi service, and Audi parts. With a reputation for providing outstanding customer service, Audi Clearwater is one of the premier Audi dealerships in the greater Tampa Bay area you can trust. Nothing makes our sales staff feel better than receiving positive customer testimonials applauding our sales and service teams for being attentive, customer oriented staffers. As a dealership we are very thankful to have amazing, loyal customers who have made us one of the largest Florida Audi dealers by volume for new and used cars. 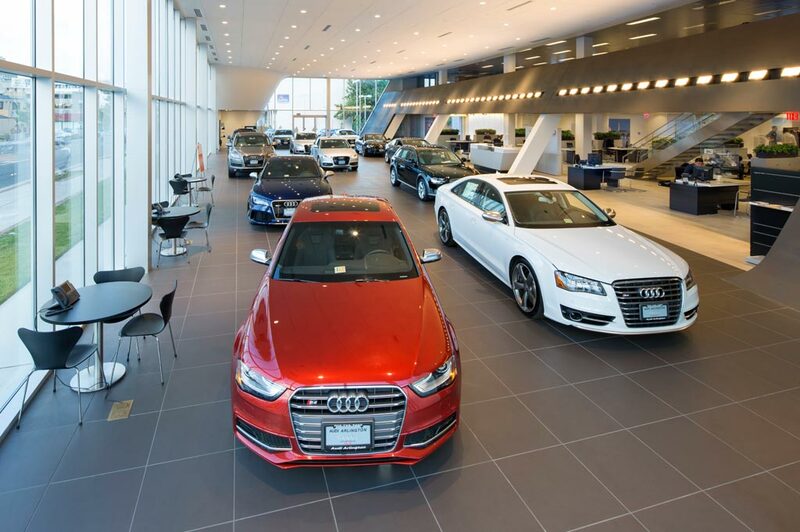 When you arrive at our dealership near St. Petersburg, you are invited to either come inside and grab a drink and meet with a sales representative, or take an opportunity to explore your options of brand new Audi vehicles like the A4 , A6, Q5, Q7 and more! As for used cars, there are several options available. We offer a wide selection of certified pre-owned and used cars. Vehicles that are certified pre-owned have undergone an extra rigorous 300+ item inspection, spanning bumper to bumper and represent the absolute cream of the used car crop. The vehicles that pass the meticulous examination are sold with a two year, 50,000 mile warranty, not to exceed 100,000 vehicle miles. * Audi's that are Certified Pre-Owned represent the absolute finest used cars available. Also included in the Audi Clearwater used car inventory is the bargain center where you may find used cars under $12,000. At our Audi dealership near Tampa, we search the area to be able to provide our customers with excellent quality affordable used cars. In the bargain center you will find cars, trucks SUVs and mini-vans to fit any budget. If you are worried about paying for your next new Audi or used car from Audi Clearwater, don't worry, we have several financing options available for new and used cars. For the customer's convenience, we have added an online credit application to make the process of buying your next car easier. Not sure how much you can afford as a monthly budget? Don't worry, because Audi Clearwater has you covered with our payment calculator to help you figure out that perfect budget for your Audi or used car. Our Audi dealer's service department in Clearwater is ready and able to handle all of your vehicle's needs. While you are with us, we encourage you to take the time to browse our complimentary service tips , or go ahead and fill out a questionnaire to ask one of our Certified Audi Specialists a question directly. Our specialists can tackle any problem for your new or used car. An added advantage of purchasing a vehicle from Audi Clearwater is that we have our very own Collision Center located in St. Petersburg, staffed with industry experts who have achieved the highest level of certification possible for their respective fields. Whether your Audi has a minor scratch you want buffed out or if the vehicle requires serious body work, our Collision Center is the place to go. If you are in the market for a new Audi or a used car near Tampa, we hope to see you soon. For more information regarding our Audi dealership, and our selection of new and used cars, you can find us on Facebook or Google Plus. We have spent years building our reputation as being a premiere dealer in the state of Florida, come experience why! *Check with your dealer for terms and availability.